I am not, I repeat, NOT an athlete. Although I love walking, and can even walk at quite a pace, I am not athletic at all. We are not an athletic family. We love art. We are regulars on the culture scene. My idea of running is that the engine is here to stay! Yet I have a dream, one that I have kept quite well hidden, well that is until now. Deep down, in the very darkest recesses of my heart there is this desire to run at least a 5 k. There I have said it, now I want to hide! So, that is how I find myself at this point in my life where I have bought the shoes and actually donned them. Now it is time to set out on the journey. Time for the unwilling athlete to step up! This makes me think of a quote I read in a book by Robert Holden of the two caterpillars looking up at a butterfly flying overhead. 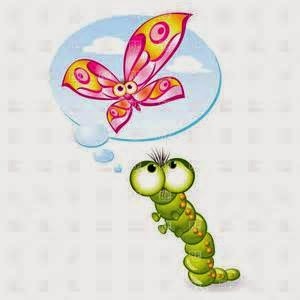 The one caterpillar said to the other one "You will never get me up in one of those things!" Surprise, surprise! What was at that moment a scary thought to that little segmented fellow was to soon become a reality. Not that he really had a choice!! Yet stepping out from our comfort zone can be equally daunting, and although we usually think that we have a choice whether we want to or not, we do not actually have a choice, not if we desire to grow, or improve or evolve. It is very easy to sit back and let life pass by, to be a spectator, but within every person is that little voice calling out "there has to be more!" That is the reason new places are being discovered, new galaxies explored and new cures are developed. That is exactly why man has been to the moon and back. My little caterpillar friend might be very skeptical about taking flight, but it is only through the process of metamorphoses that he will become all he is destined to become. How wonderful to be a caterpillar. One day you are a wiggly, hairy little critter and then some days later you can spread your beautiful, colourful gossamer wings and take to the skies. Riding the scents of dusk, drinking exotic nectar and dancing among the daffodils. What a life. A quote comes to mind, unfortunately I am not sure who the author is, but it says that in order to fly you have to really let go of being a caterpillar! Yes, that is it. Step away from your comfort zone, or in my case, the life of a couch potato! Let go of your safety net, and all those excuses, and pursue that hidden dream, that long forgotten goal. Write your bucket list and start ticking off those things you have finally done. Well, then, that said, I guess it is time for me to set off on my first run (if toddling down the street can be called running) ! If you flutter by here, feel free to share your goals and your dreams with us, or maybe a word of two of encouragement, haha! I am also not an athletic person,but this year I have been faced with a whole new world of athletics,from running to hockey to netball and as scary as it is,I find that the more I am faced with it,the more I like it and the better or easier it becomes. I have also recently joined a running club and taken part in a few 10km runs,but I have a much bigger goal in mind on my bucket list. I am lucky to have a wonderful mother who is going to take the plunge with me and train for a pretty large event. Like my dad always said with piano practises: "Practise makes perfect". The same can be said with running. Thank you so much for your wonderful and encouraging comment! I will keep that advice in my: "Practice makes perfect!"